Ready, Go. 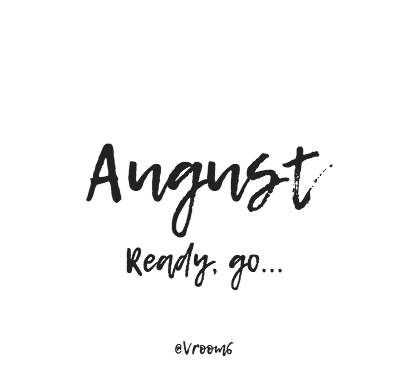 Welcome to August! My hope is that all educators took time these past couple of months to pause, rejuvenate, find balance and give back to family and friends the time, energy and love that many devote to their schools throughout the year. The calendar has turned, August has arrived. I truly believe that having this time away is intentionally designed into our work. We each know what we give of ourselves when students and staff are present. The weeks away are a needed period of time to reset when they are not. These months are intentional, they are purposeful, they are essential. Today is a new month on our calendars. For many, if not most, it is the month in which we officially get our mindset on the return of school. It is the time in which we tell ourselves to get (officially) going. The reality is, however, if you are an educator like myself, you most likely never truly took time "off". Instead, you stayed connected via social media through twitter conversations and gathering of information. Many of us dove into the latest book(s) about the world in which we work. And each of us picked up the phone on more than one occasion to meet up with a teammate or colleague that inspires us every day we walk into the school buildings we serve. Learning never took any time off these past few months. Our growth continued. Today, however, we officially begin. Emails from administrators will begin to hit our inboxes. Invitations for professional learning events will come from the districts we serve. And our own children, if you have them, will start asking the inevitable question, "how many days of summer until school starts?" For my children, the answer is 21. To each of you reading this - it is time. It is time to be thinking about our classroom design and how we will be purposeful in building our relationships with students and staff. It is time to be thinking about lessons and instruction and how we will reach our learners where they are knowing where they need to be. It is time to ensure we are reaching the social and emotional needs of every child, every day, to the best of our ability. Today, it begins. Good luck in the days and weeks ahead. You are committed to what you do and how you do it. Make this school year your best of all. Take on new challenges, embrace opportunities and be inspired and motivated to be at your best. Welcome to August, friends. It is time to do the work.